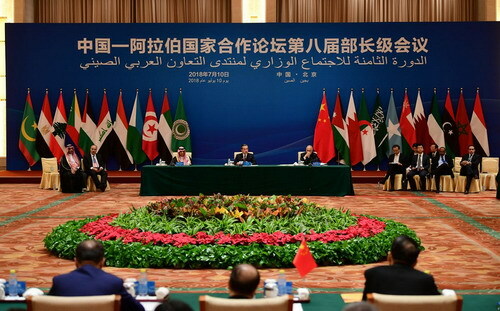 On July 10, 2018, State Councilor and Foreign Minister Wang Yi presided over the 8th Ministerial Meeting of the China-Arab States Cooperation Forum in Beijing. He emphasized in his speech that the Palestinian issue is the root cause of the Middle East issue. We cannot let the Palestinian issue be marginalized. We cannot let Palestine's rights of founding an independent state be traded. We cannot let the Palestinian people lose hope. Wang Yi expressed that China will continue to firmly support the establishment of an independent Palestinian state enjoying full sovereignty on the basis of the 1967 borders with East Jerusalem as its capital, the greater integration of Palestine into the international community, as well as the holding of new international conferences on the Palestinian issue. China will continue to offer humanitarian aid to Palestine, support the important role of the United Nations Relief and Works Agency for Palestine Refugees in the Near East in easing the humanitarian situation of Palestinian refugees, and is willing to make contributions to this end.